SerpiMastic provides an ultra-durable, weather, UV and chemical-resistant protective coating that provides high impact protection for asbestos, cement asbestos board and thermal/insulations on boilers and pipes, and other substrates that demand a ultra-durable mastic coating. 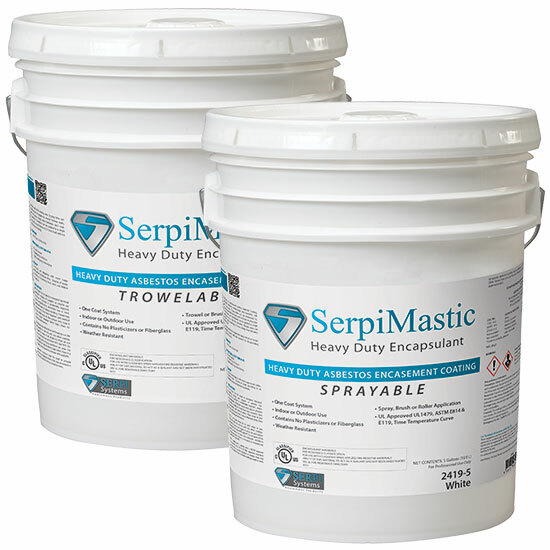 Available in two viscosity grades, sprayable and trowelable, SerpiMastic is UL classified as a bridging encapsulant for use with classified sprayed fiber and cementitious mixtures. Surfaces to be protected should be free of excessive loose dirt or oil. SerpiMastic Coating will bond tightly to virtually any surface. For repairs of large damaged areas, weak insulation or areas requiring greater mechanical strength apply Fiberlock Lag Kloth or Serpi Wet-Wrap ‘N’ Seal prior to SerpiMastic. Apply with trowel or brush. SerpiMastic Trowelable can be applied using any ordinary steel mason’s trowel or similar spreading tool. For smoother finish use a wet trowel. SerpiMastic is supplied ready to use, thinning is not required or recommended. SerpiMastic is a water-based coating material. Coating application thickness, temperature and humidity will affect drying rate. Drying time can be minimized by applying several thinner coats, with 24 hours drying time between each coat. SerpiMastic Trowelable can be applied in a single application up to 500 mils (12.7 mm) thick without cracking or shrinking. High humidity may retard drying. Clean tools and drippings with warm soapy water before SerpiMastic dries. Dispose of waste according to all existing local, state and federal regulations. Do not ingest. Do not apply to energized electrical conductors. Always use goggles or suitable eye protection. If product is accidentally ingested, unless contraindicated, administer two or more glasses of water and induce vomiting. If more than trace amounts have been ingested seek medical advice. Wash areas of skin contact with soap & water. Consult Material Safety Data Sheet for additional information. Do not add water. Keep lid on until ready to use. Stir thoroughly. Do not mix with any other coatings, solvents or colors in oil. Apply on when air and surface temperature are below 40°F and 90°F. Do not apply when drying conditions are poor. Use adequate ventilation during application. Store in a dry place at temperatures between 40°F and 90°F. Approved respirators must be used to prevent inhalation of asbestos fibers that may be present in the air. Protective clothing should be worn.